In 2019, 7.1 million people in South Sudan are in need of humanitarian assistance. 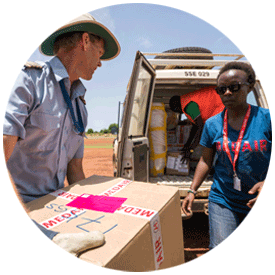 Medair has worked in South Sudan since 1992 and is one of the most active humanitarian relief organisations in the country. Since the end of 2013, conflict has cost almost 400,000 lives and left six million people, of a population of 11 million, desperately hungry. Alarming levels of child malnutrition are seen across the country, with some of the highest rates in the world. Families have been uprooted and children have been separated from parents. There are disease outbreaks and access to safe water is limited. Displaced people have nowhere to sleep and no protection. Women have few places to safely give birth. Hundreds of thousands of lives are at risk. Medair responds to sudden emergencies across the country such as mass displacements, high levels of life-threatening child malnutrition, and outbreaks of lethal contagious diseases. Our health, nutrition, and water and sanitation teams work together to coordinate responses that save lives and increase the resilience of people. Specialists in health, nutrition, hygiene, safe water, sanitation, shelter, and distribution of essential supplies respond quickly and bring essential relief to communities in dire need. When emergencies turn into longer-lasting crises, Medair stays to support the community. We focus on the most vulnerable to disease: pregnant women, children under 5, and their mothers. We work with existing health clinics or establish new ones to improve access to quality health care. In locations where there is no other provision, we provided skilled health staff to help pregnant women deliver. Our nutrition programming treats acutely malnourished children, pregnant women, and breastfeeding mothers. And we teach mothers how to better care for the health of their young children. Medair provides vulnerable people with access to safe drinking water and hygienic sanitation facilities. We teach people how to improve their hygiene practices to stop the spread of diseases. Angar doubled her weight in 60 days!